You think Delta is a phenomenal airline… Compared to Aerolineas Argentinas. Having internet and phone service right at your fingertips creates a sense of euphoria. You barely avoided pressure ulcers on your bum from sitting for 17 hours on a bus. You become a cow snob, because you know what real steak tastes like now. You now have an appreciation for how fantastic pumpkin can be outside of a pie. Instead of visions of sugar plums, you have spry glacier men leaping and dancing in your head. You find it strange to be bathed by a shower head instead of a massive waterfall. It feels unnatural to walk without a gale force wind pushing you around. You greet Wyatt, the grumpy US customs official, in Spanish accidentally and he’s not amused. It feels a little sad to not have at least one beautiful sight take your breath away each day. 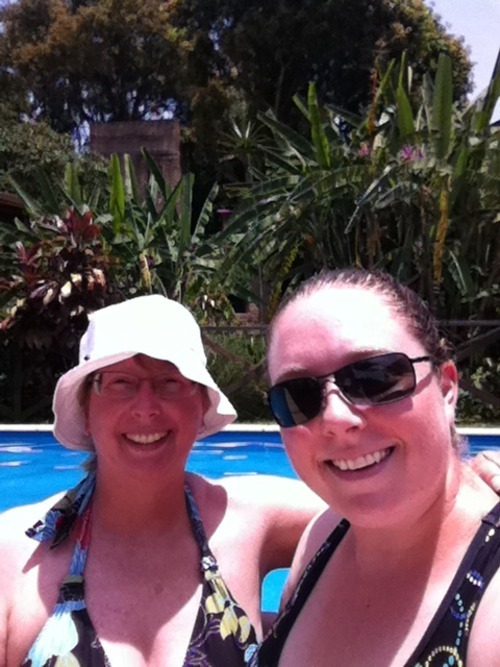 Smoothing out the end of our trip in Buenos Aires …. 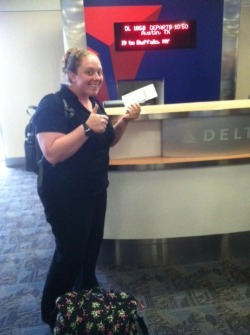 Ready to board airplane: check! …. 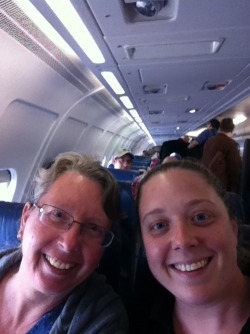 Flying the friendly domestic skies: check! …. 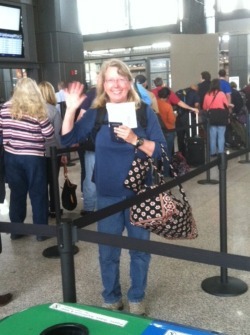 Back home in Austin safe and sound Sunday afternoon, according to plan! …. Mom on the final leg of her trip– Arizona bound! … as we wait for our transport to the airport. 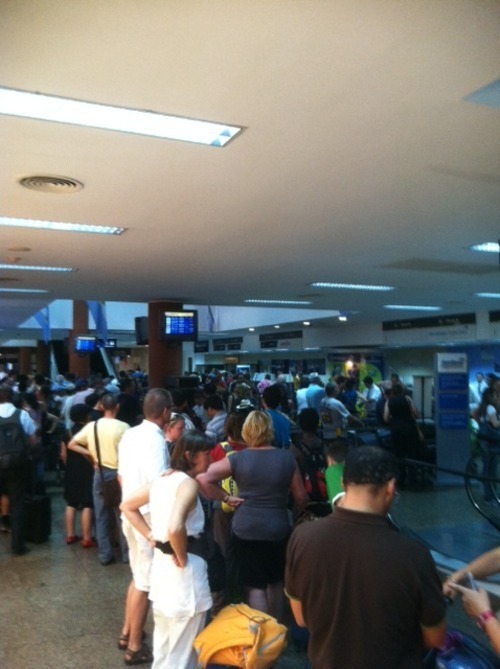 If only we knew at 2pm we were not walking into the Puerto Iguazu airport but the First Portal to Hell (in the photo, that’s only the 1st half of the line that took 2 hours to get through!). 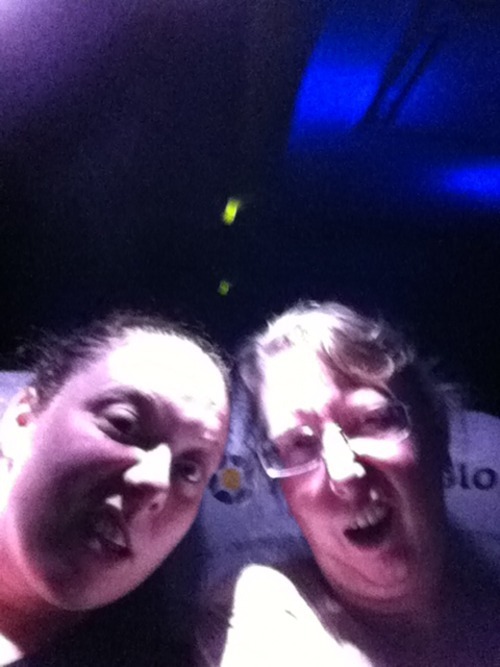 Then after 5 hours total at the airport, we entered the Second Portal to Hell: The 17 (yes, 1-7) hour bus ride to reach Buenos Aires. 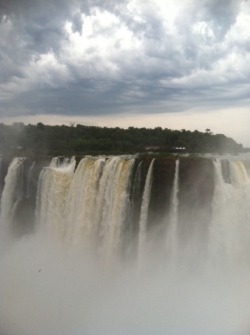 Iguazu (“Big Water”) Falls. No kidding!! 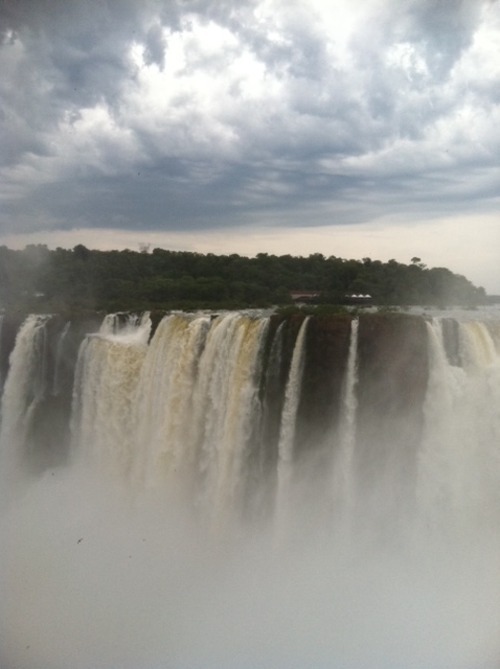 In the native people’s language Iguazu means “big water”. The argentines call the falls “cataratas” which I’m told is “cabeza de vaca”. Cow head?? I don’t get these argentinos!! We spent the day exploring the national park in a combination of wonder, awe, and feeling like herded cattle. We didn’t realize we were having a guide, Hugo, who for some reason only calls me out by name throughout the day. It seems having thousands of people in small groups led by a fast moving, mostly Spanish speaking guide holding an umbrella in the air to herd us to/from the tiny trains, catwalks, and viewpoints is how this park rolls. Not our style, but it did help us maximize our day by moving people along and pointing us in the right direction, I guess. Moooo. See, and now I’m part cow, too. 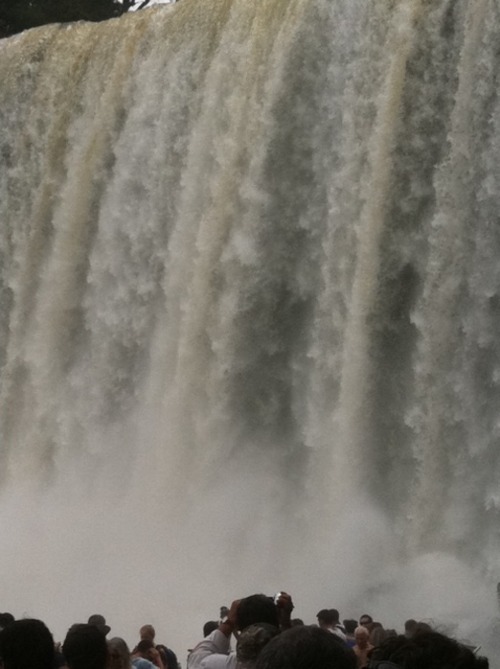 The number, size and strength of the falls here is phenomenal! 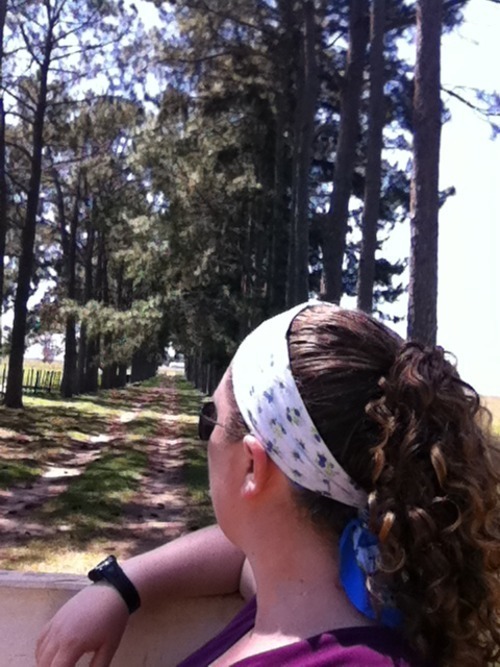 We spend all our time on the Argentine side, because all the Brazilian side is good for is panoramic views. We wanted to be up close and personal. The photos will illustrate more the magnitude (especially the ones still to come from my camera). We cover all the main areas (see the map): Garganta del Diablo (the devil’s throat), Upper Circuit, and Lower Circuit. We walk on a series of metal grated walkways elevated over the racing rivers, slopes of the mountains, and steep drops of the “smaller” falls. These walkways take us out to balconies to truly experience the power and volume of water rushing from the falls! “Big Water” is definitely an understatement. The highlight definitely was our safari nautico! You can see in one of the photos a tiny boat down on the river headed straight into the falls. That was us about an hour later. Suited up in life jackets, our belongings in dry bags, and the basically pointless poncho donned, we embarked on the Rio Iguazu. We buck rapids and go fully under the huge falls on the right of the map photo, then on the lower left. It was amazing to peek at through one squinty eye while my other eye was squeezed shut to keep the massive amount of water from stealing my contact lens. I was on the outside edge of the boat- thanks, mom! – It was a drenching and breath taking (literally I couldn’t breath!) from all the water and laughing with so much excitement! The “Big Water” is like a deluge from an arsenal of showerheads and firehoses! We then zip down the river, rapids splashing, captain tipping the speeding boat from side to side for fun. Once soaked and giddy, we climb an exhausting and breath taking (not in the fun way) amount of steps to reach our finishing point to put a dry shirt on a wet body. We board an open, high safari truck for a relatively uneventful, but informative, ride through the jungle to end our excursion. Some of the more spectacular views! In the 3rd photo, you see a small boat headed into the falls (we did that! see blog entry). In the 4th photo, you could walk all the way out to the furthest heads in the photo. I couldn’t take the camera because I was soaked! Amazing! 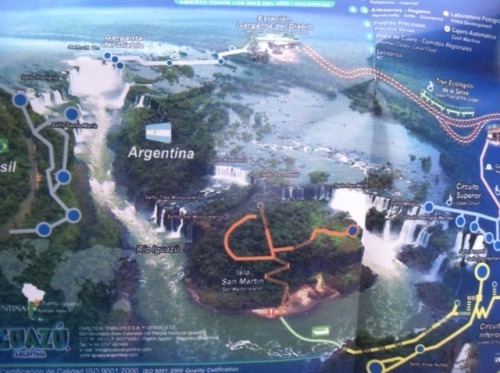 The map of the Iguazu Falls national park. We tackled it in one day! I thought the map would help to show the layout and magnitude of the falls. Six hours and one paying off of the police later… Our arrival to Puerto Iguazu. Yep, nothing says a good time on a Wednesday like passing a police officer across a double yellow line. Oops. Jose gave us a lesson in the corruption of the police here– in order to avoid the five hour process to go to the station, file paperwork, and issue a ticket he just paid him off with 200 pesos (approx $50 USD). Apparently that is not illegal. Despite this, we had a good drive with a few stops and enjoyable conversation along the way. After a little lounging about the hotel (and desperately trying to connect to wifi that doesn’t work at this hotel), we set off to explore Puerto Iguazu. Apparently wifi is not reliable in this town, but luckily I stalked a girl with a laptop and could connect briefly on a street corner to post my last Patagonia notes. But I digress to my wifi obsession… I don’t know what Argentina has against street signs, but one could make a killing in that wide open market here. Further, a map is no good without said corresponding signs. Go figure. 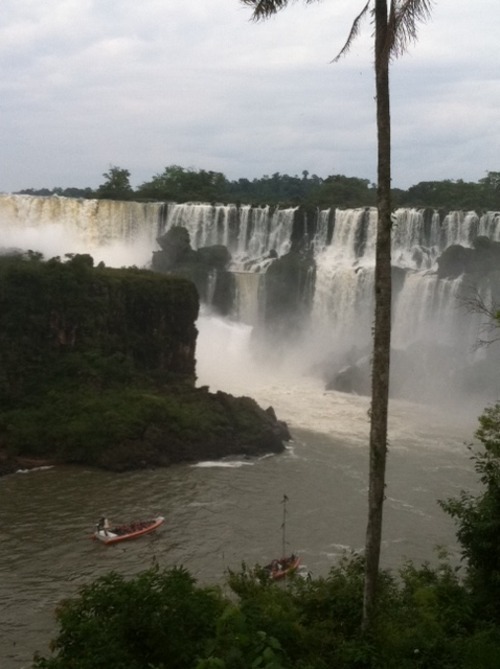 Eventually, we found Tres Fronteras where you could see Paraguay, Argentina, and Brazil as they meet on the riverbanks. A long walk for a quick photo opp, in my opinion. On further exploration of the town center, we discover the following: 1.) 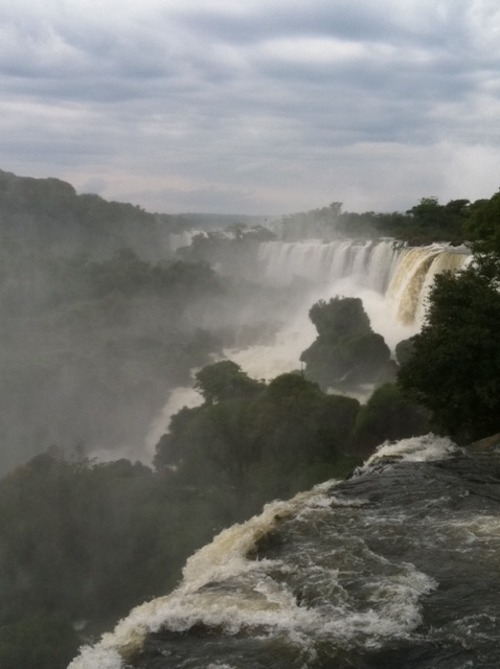 Puerto Iguazu is hot, hazy and humid (damn subtropical jungle), 2.) the red clay makes everything have a seedy– err, “organic”– quality, 3.) the streets lined with shops have a junky touristy feel, 4.) the restaurants have nothing to brag about. And thus, our exploration ended. Back to the hotel for the pool, a drink, and a relatively mosquito-free night’s sleep. The next day (Thursday) we will go to the national park/ waterfalls! 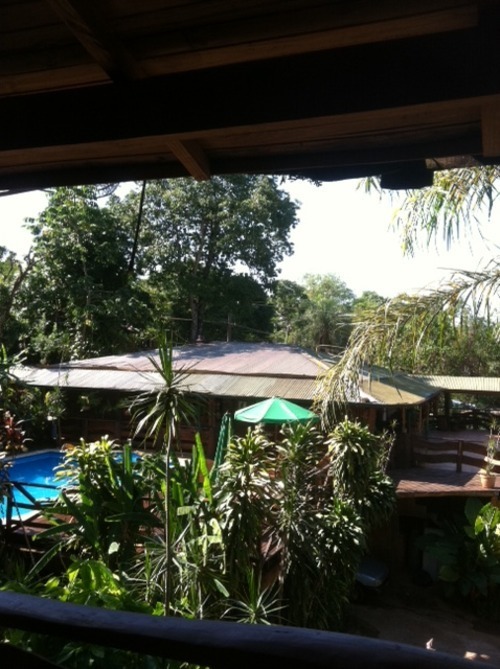 After 6 hours driving by pick up truck, we made it to Los Troncos, our hotel in Puerto Iguazu. This is the view from our rustic balcony. It is 5 long hilly blocks on red rocky/clay roads (think cobblestone but not nearly as well planned and jagged) from the center of the town. !Ciao, Estancia San Lorenzo y las pampas!